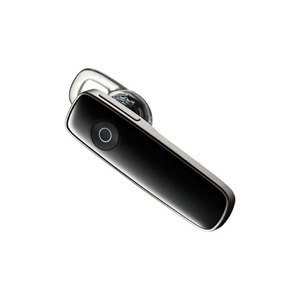 Sleek and lightweight, the Plantronics Marque M165 Bluetooth� headset is ideal for smartphone users, freeing you to tap, type and swipe. Turn it on and it steps you through a voice-guided pairing for Android smartphones and iPhone. When a call comes in, just say �Answer� � no buttons to press. You can even listen to music, podcasts or GPS directions, and with our Vocalyst service you can use your voice to manage emails, texts and update Facebook� or Twitter�. The free MyHeadset app gives you tips and tools to get more from Marque. Plantronics Marque, the smart way to connect with your smartphone. Take calls without pressing a button � just say �Answer�. MyHeadset app gives you tips and tools for iPhone� and Android� smartphones. Vocalyst service lets you use your voice to manage emails, texts and update Facebook� or Twitter� . Stream music, podcasts, internet radio, GPS directions and more. Headset talks you through pairing process for iPhone� and Android� smartphones.